Late Saturday night I flew back fromCleveland. I was attending Dan Kennedy’s Direct Mail Conference and walked away with an incredibly simple technique to increase the effectiveness of direct mail I’d like to share with you. Now before I jump into the meat, let me tell you about the back story. Dan and I go back to 1999. I was just learning direct marketing thanks to a guy named Jay Abraham. One morning, while at my in-laws at the time, I was reading a janitorial magazine. In it, I saw an ad that was definitely Jay Abraham’s style by a guy named Joe Polish, the marketing guru to carpet cleaners. I called Joe up to talk shop, learn more about his business and see if he was a Jay Abraham guy. Turns out he was a Dan Kennedy guy. Joe turned me on to Dan and I invested around three hundred bucks in one of his manuals. Since then, I have attended a ton of seminars and subscribed to multiple newsletters. I can’t even calculate the tens of thousands of dollars Dan has received from me…Money well spent! It’s this type of education responsible for our members doing so well. I took what I learned from others and applied it to restaurant catering. In the early days, before Dan was a big deal, he would hold open “roundtable” events. I flew intoClevelandthe Saturday after 9-11 to sit around a table at Denny’s with around ten guys. That trip was well worth it. Dan’s early seminars consisted of Dan, an overhead projector and around two hundred serious direct marketers in a crowded hotel room. This recent event reminded me of the good old days; me and a handful of the old timers learning and reminiscing about the past. 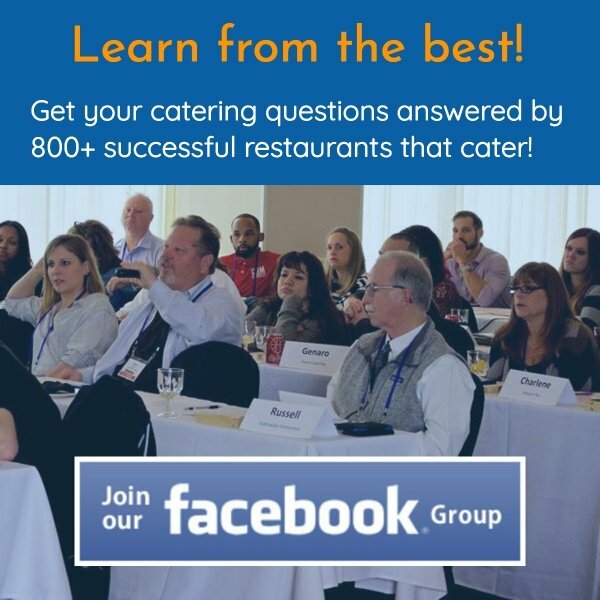 Don’t underestimate the power of your education and plugging into a group of like-minded business owners, like the group Catering Coaching Calls provided by www.RestaurantCateringSoftware.com. If you have a really good list of catering prospects…like the name of every catering decision maker in your trade area…then you should be lead generating to them each month. Most people are lazy and stick to one direct mail piece. When I first opened Corky’s we printed up a year’s supply of self-mailers. That’s what was mailed each quarter. Not every decision maker responds to a flyer. Your job is to design as many different mail pieces as will work. You’ll then want to put them into a rotation. For instance, one month your list will receive a color postcard. One month it could be a black and white card on colored stock. You can test a blind letter or our three-step lead generation letter. You can even test telemarketing. Though I’ve used the technique of various mailing pieces in the past, I never realized the purpose. So, if you have a targeted list of catering prospects, develop multiple direct mail pieces to capture as many customers as possible. The great part of this strategy is your competitors have absolutely no idea how to do this. If they did, they’d be too lazy to do it. 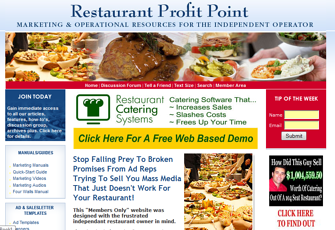 Today, block off an hour to sit with your laptop and a cup of coffee and peruse our members-only website, www.RestaurantProfitPoint.com. 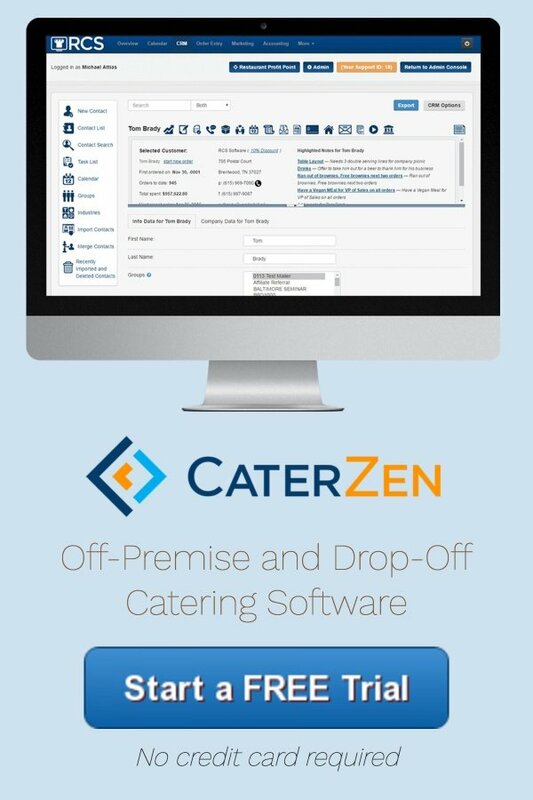 You’ll find a mountain of different marketing pieces and formats you can adopt for your catering business.